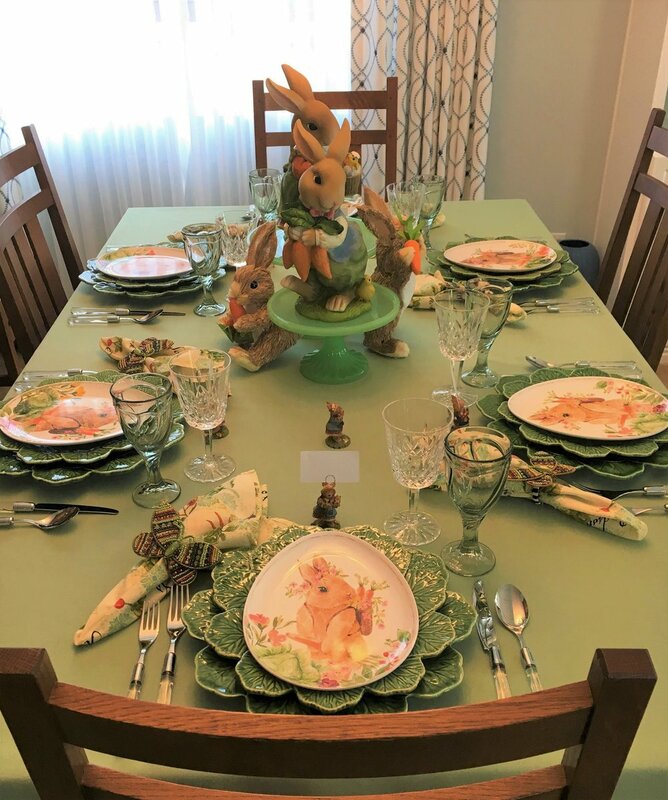 I started creating this third Easter table after finding the bunny salad plates at HomeGoods this spring. I remembered the two bunny figures I have that I could use as a centerpiece along with a couple sisal ones I found at Pier 1 this month. Can’t remember where I bought the two larger bunnies, I have had them for awhile. I used to do major decorating for all holidays. I put the two taller ones on a couple of green glass cake stands I have that I bought at Pier 1 this spring. The tablecloth either came from HomeGoods a few years ago or I bought it online at a discount tablecloth site. 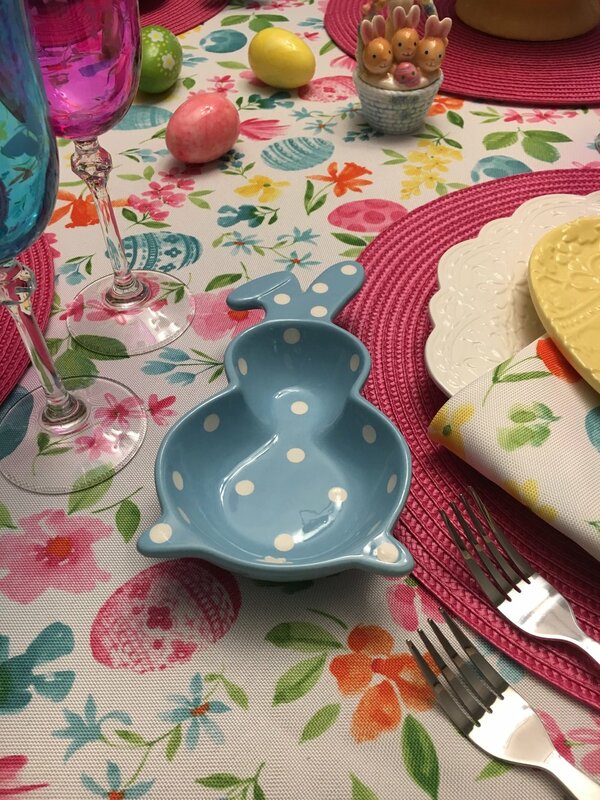 HomeGoods had some really cute Easter dishes this year. As soon as one design sold out, they seemed to get even cuter ones in stock. This cute one had to come home with me and it is melamine, even better, it won’t break! 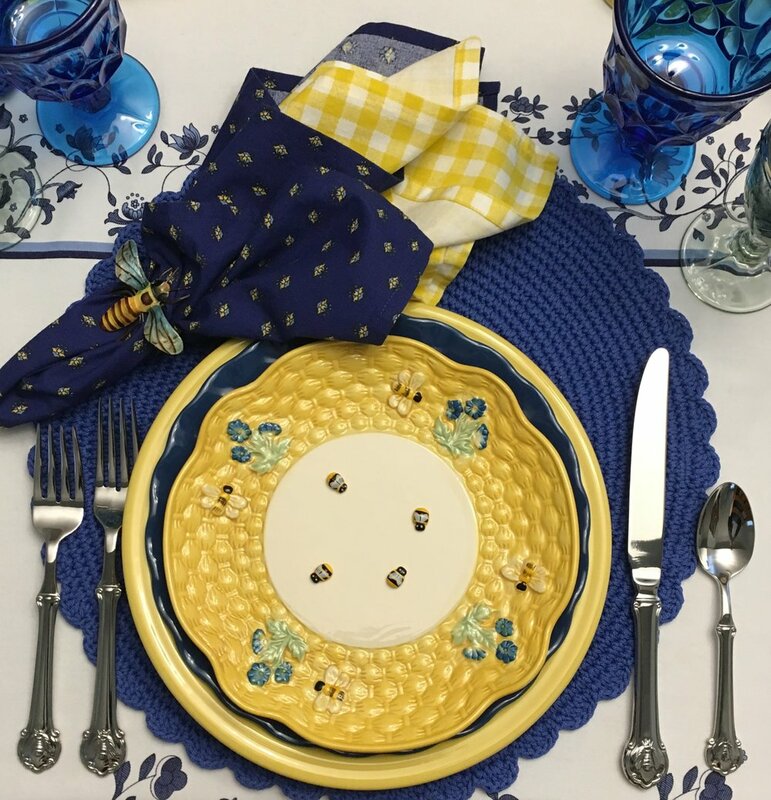 The dinner plate and charger are both Bordallo Pinheiro in the Geranium pattern. I bought them a few at a time on Ebay several years ago. The flatware is labeled SR Showroom Italy but it is called Zaffiro flatware. Not sure where I bought it. I have it in a few different colors because I love the simple design. This clear set is a favorite because it picks up whatever the color of the tablecloth is if I don’t have other flatware that matches. 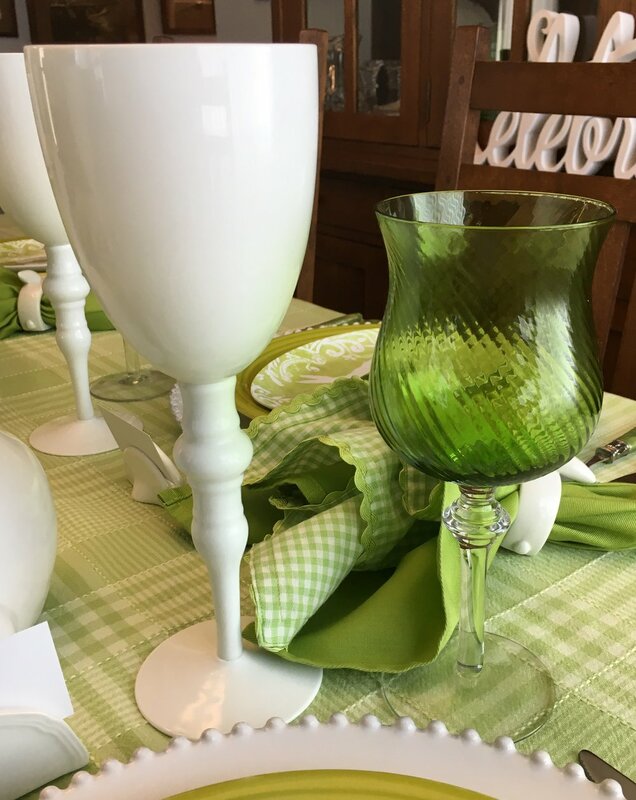 I used the green goblet already twice this year in my St. Pats table and my Bee table. They are Noritake Sweet Swirl in light green. These were made between 1985 and 2005 and I found them on ebay. The clear goblet is my wedding crystal, Lismore made by Waterford. The Lismore pattern was created in 1952 and is one of Waterford’s most popular and long lived patterns. Found the napkins at HomeGoods a few years ago. I call them the vegetable napkins because they have different vegetables on them including carrots that match the carrots the bunny is holding on the salad plates. 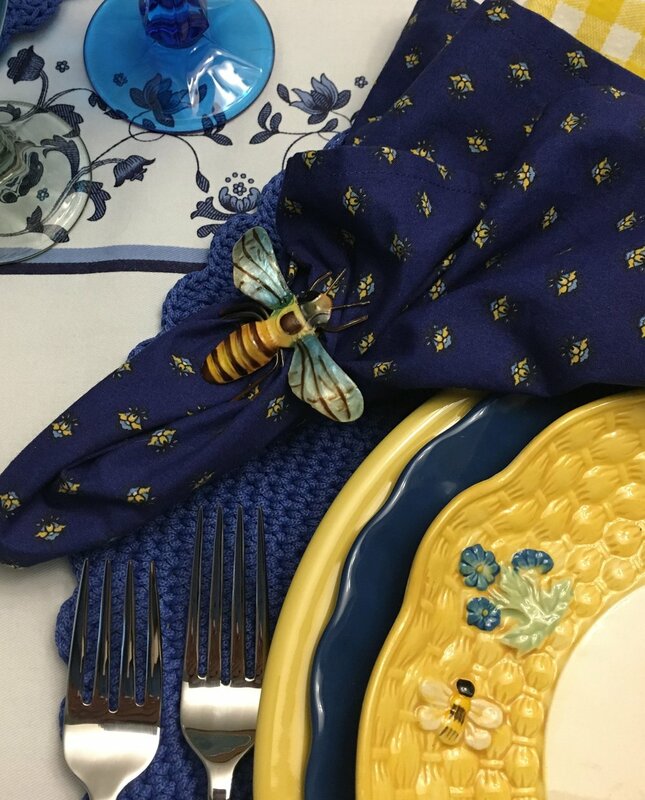 The butterfly napkin ring was made by Mackenzie-Childs. They have the same napkin rings now but in blue tones. I loved these napkin rings as soon as I saw them and I bought a couple at a time online over several months until I had twelve. I used them on my St. Pats table this year too. I bought the place card holder on Ebay, I found a few at a time till I had a set. It was made by Boston Warehouse. 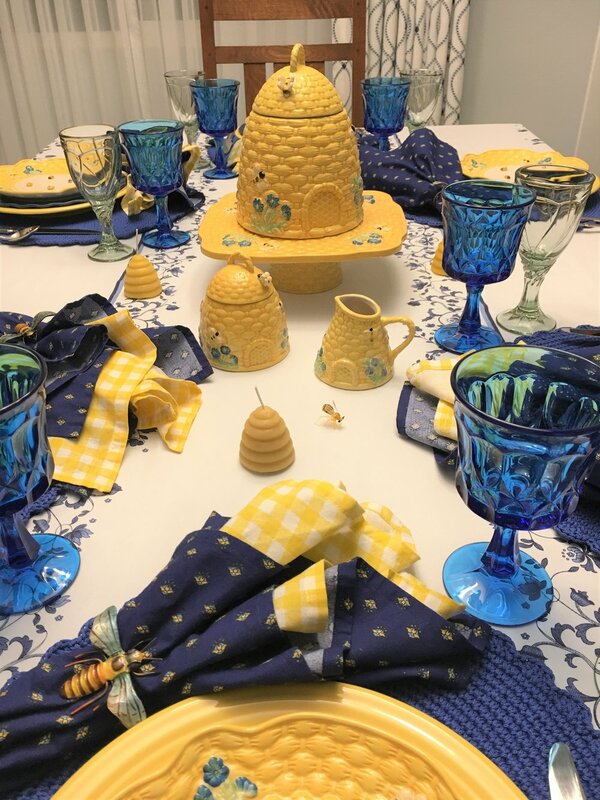 This is actually the family Easter table this year, we will gather round after I add a couple more place settings. Hope you all have a wonderful Easter! My second Easter table theme for this year with lots of bunnies. 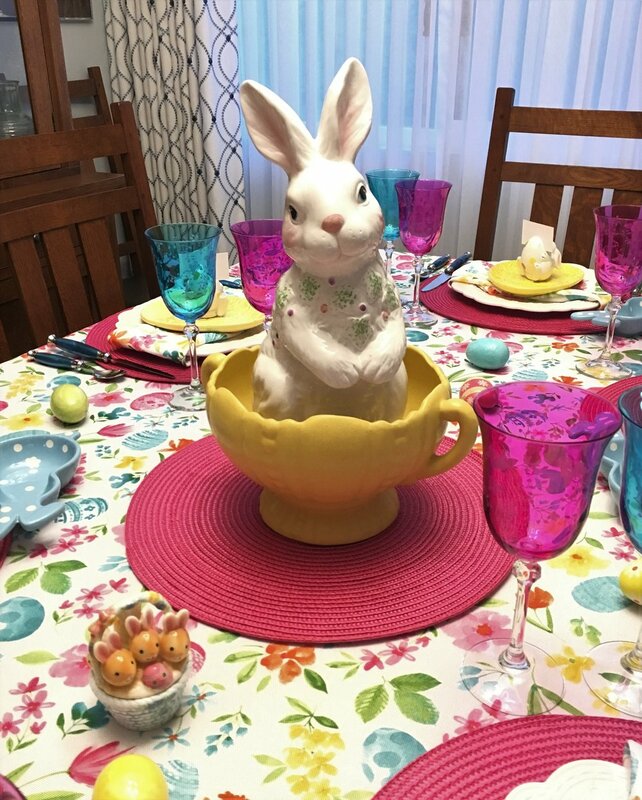 The centerpiece bunny came from Pottery Barn a few years ago. There are several similar ones for sale this year at various places. The tablecloth probably came from HomeGoods some years ago. I found the other large bunnies at HomeGoods this year. Found the tiny bunny at a garage sale, there is a second one on the other side. I love these little ones! 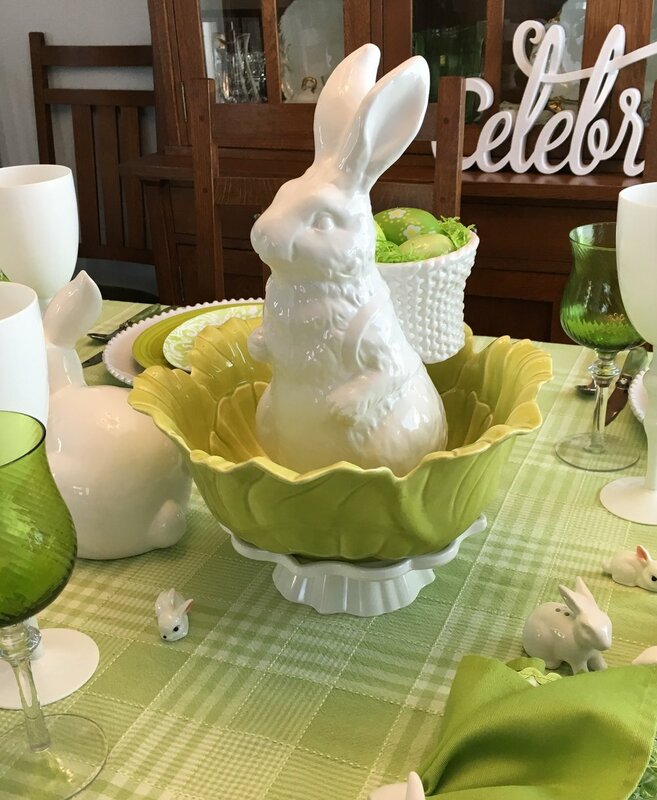 The green and white bunnies salad plate was at HomeGoods this year. I developed the table theme around this plate. The dinner plate is Fiesta in lime green. I think I got those on sale at Macys some years ago. I used the same charger in the Winter White tablescape my daughter and I did in February. I bought it at William Sonoma a few years ago and it’s called Antique Beaded. The flatware is Madeline Green flatware and I bought it at World Market some years ago. You can also see it in my Fall tablescape last year. I use this flatware often. I bought the tall white goblet on sale at Z Gallerie some years ago. I have black ones also. It is the tallest goblet I have in my collection! The spiral green goblet came from Pier 1 a few years ago. I use this one often in tablescapes. You can see it in last years Fall tablescape. It normally looks tall but not next to the white one! The green napkin came from Pier 1 a few years ago. The green check one came from HomeGoods this year. Can’t remember where I bought the bunny napkin ring. I Love that floppy ear! The bunny salt and pepper came from HomeGoods this year. Can’t remember where I found the place card holders. I bought the large green pottery bowl years ago on ebay. It usually sits on the coffee table. Lots of bunnies! Hoppy Easter! Bunnies and eggs on a Spring table. 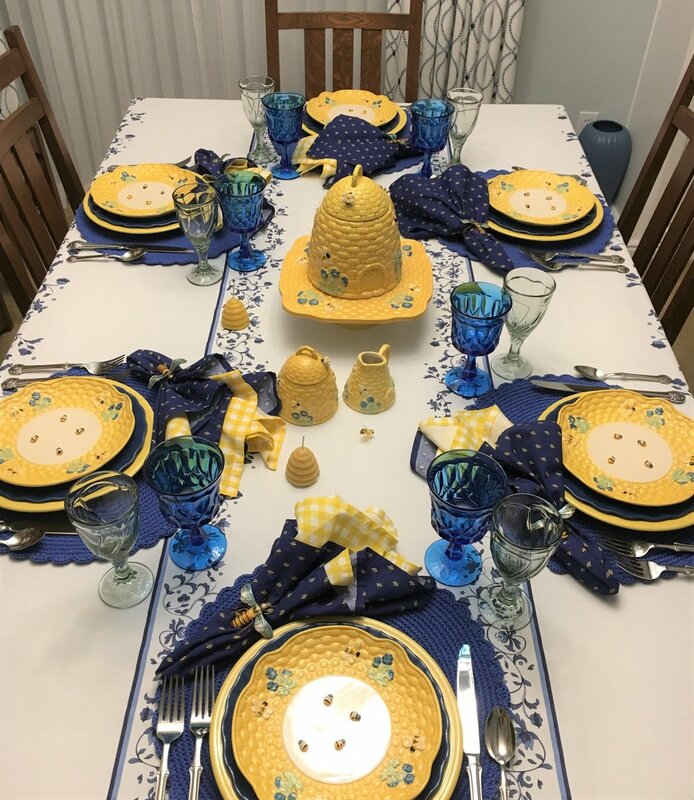 I had three different ideas for Easter tablescapes and couldn’t decide which one to do so I am doing all three, one each week until Easter. I have seen many table settings lately with neutral tones or gray tones. Somehow I just can’t get into doing one of those, at least not right now. When I think of Easter, I think of bright colors. As soon as I saw this tablecloth at HomeGoods a couple weeks ago, I knew the color scheme for one of my Easter tables. I have had the rabbit centerpiece for a few years, can’t remember where I bought it, same with the eggs and small bunnies candle. I bought the yellow bowl on ebay several years ago when I was collecting pottery. The deep pink place mat (camera doesn’t show that it really matches the goblet) came from Pier 1, I have several of these in different colors. I bought most of them on sale and I found some online. The white dinner plate is one of my favorites, I love the scallops and the raised design. I bought it at Pier 1 maybe last year, the design is called Lacy. The yellow egg plate came from HomeGoods a few years ago and was made by Magenta. I have it in blue, pink, green and yellow. I love that raised design too and it works perfectly with the dinner plate. I found the napkins at HomeGoods with the tablecloth. Tucking them under the plate saves having to use a napkin ring. Handy when you don’t have one you like that will work. I found both goblets at HomeGoods a couple years ago. They are Le Stelle crystal and were made in Italy. I like the etched design with the butterflies and flowers. How I love bargains from HomeGoods! 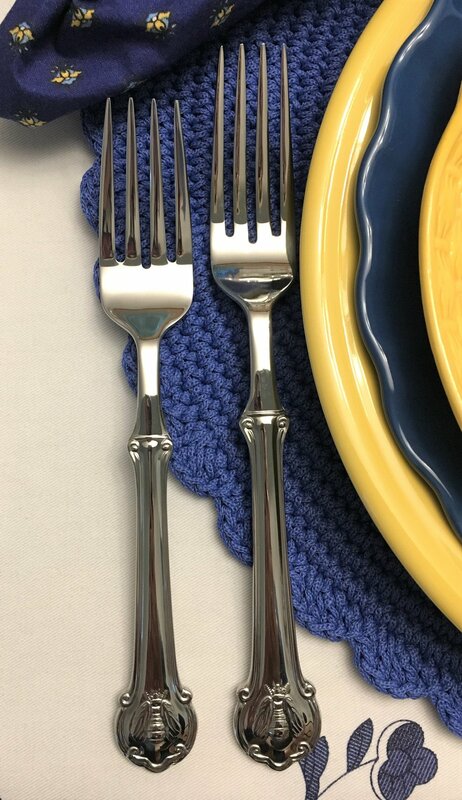 I bought the frosted blue flatware on sale online at Wayfair a few years ago, it is made by Cambridge. It is 18/0 so the fork tines are a bit sharper than I would like but I really liked the color. Wayfair has really good sales on flatware sometimes. I found the place card holder at HomeGoods a few years ago. I suddenly remembered them and knew they would work well on this table. I found this cute little bunny bowl at Hobby Lobby a few weeks ago, they have them online too. It comes in blue, yellow, pink, and something they call green which is really more of a light turquoise. Had to have a few in each color, polka dots are a great mix and match pattern. I pulled several different things together for this table, using the tablecloth as a guide. This about as different from neutral or gray tones as you can get!